A leading modern Urdu poet and playwright from Pakistan. 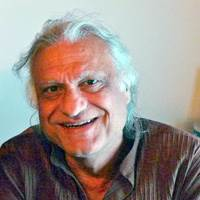 Poet, Playwright, Director Sarmad Sahbai is one of the most prominent poets of Pakistan today. He studied at Government College Lahore and was known for his poetry injecting fresh imagery and modern idioms to Urdu poetry. After college he joined PTV where he wrote his first tele-play. The Lampost (1968) for which he was charge sheeted by the government. He continued to write plays and produced the first original Punjabi play at government college, Tu Kaun? (1971) this was followed by several other successful plays, notably The Dark Room (1971) and Phandey (1972). Three collections of poetry has been published so far.